The Aluminium Zone at the forthcoming Gulf Industry Fair (GIF) will be a pivotal area for exhibitors and visitors as manufacturers and traders showcase technology and offerings that will provide an insight into the contribution made by the industry to economic development. A key segment of the zone will comprise value-added products and the downstream, both areas in which the Bahrain aluminium industry has made remarkable progress over the years. 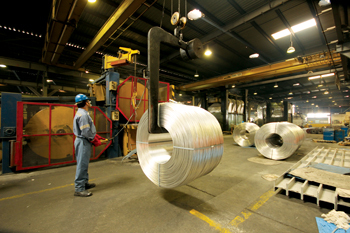 Sales of Aluminium Bahrain (Alba)’s value-added products generally range in the mid-60s in percentage terms, and downstream companies have accomplished much in creating marketable products from the raw metal they have received. Gulf Industry Fair takes place from February 9 to 11, 2016, at the Bahrain International Exhibition and Convention Centre. Led by Alba, one of the world’s leading aluminium smelters, and supported by the Gulf Aluminium Council (GAC), the Aluminium Zone at GIF 2016 promises to reflect the trends of the global aluminium industry, which continues to drive opportunity for downstream suppliers such as Bahraini firms Balexco, Midal Cables, Ameeri Industries and Turk Mechanical. Alba’s Line 6 Expansion Project will add approximately 514,000 tonnes to the company’s current annual capacity of 931,000 tonnes, which will make the company the largest single site smelter in the world upon completion with around 1.450 million tonnes. “The GCC’s importance to the aluminium sector grows year on year with the expansion of smelters in the region and the resulting expansion of the downstream products and services sector,” he said. The growth of regional smelters such as Alba, Maaden and Qatalum will create business opportunities in the downstream and this will be showcased at the upcoming event. Khalid Abdullatif, chief marketing officer at Alba, said: “The London Metal Exchange (LME) prices are imposing many challenges on the aluminium industry globally. “Hence, Alba has to reinvent itself to remain cost competitive through the cost-reduction initiatives. This has already started with ‘Project Titan’, which aims to reduce the company’s cash cost by $150/mt by January 2016. 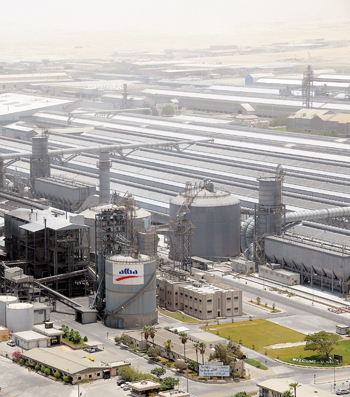 Bahrain-based companies are flexing their muscles on the global aluminium market. Gulf Industry Fair exhibitors like Midal Cables, for example, started producing aluminium, alloy rods and conductors in Australia last year in joint venture with Australia’s Power Grid Cables. This complements the 30,000 tonnes per year plant the company recently started in Turkey, producing overhead line transmission and distribution conductors. Bahrain Aluminium Extrusion Company (Balexco), an exhibitor at Gulf Industry Fair, has an outstanding track record in manufacturing extrusions. Its current production capacity exceeds a record 33,000 tonnes. Jubran Abdulrahman, managing director of Hilal Conferences and Exhibitions (HCE), the organisers of GIF, said: “The aluminium sector is the key industrial growth driver in the region. The sector does and will continue to be an important creator of jobs and business opportunities as the region’s economies look to diversifying.